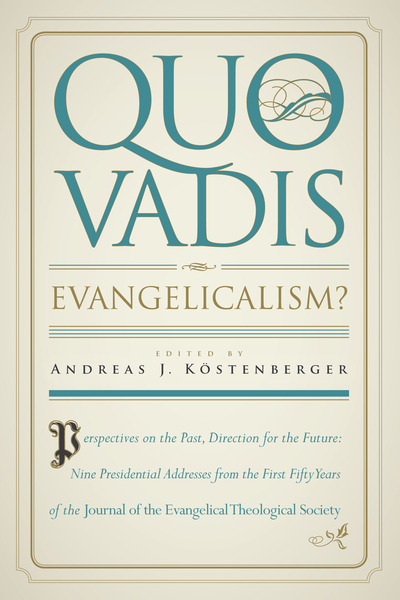 Quo vadis?-Where are you going?-is an appropriate question to ask of the current evangelical movement. To get a bearing on evangelical thought and assess future directions, the editor of the Journal of the Evangelical Theological Society , Andreas J. Köstenberger, has gathered selected addresses from past presidents of the ETS and contributed a thorough introduction and probing epilogue of his own. Covering the early years, the maturing movement, and recent times, the addresses-which span JETS' first fifty years-include discussions of foundational doctrinal issues, exegetical and theological practice and methodology, and current concerns delivered by some of evangelicalism's most distinguished leaders. These presidential addresses give today's scholars a much fuller and deeper appreciation of the history of evangelicalism and their place within it. Readers will also experience great hope for the future of a movement whose best days, by God's grace, are yet to come.